Currently running Simutrans stable 112.1 (r6212) with pak128 2.1. This server is accessible over both IPv4 and IPv6. The server will pause when no clients are connected. I think there are not enough cities in the game to allow several players to make a profitable pax/mail network and many of the industries have incomplete chains. I think the map itself is quite good, but I just don't think there are enough cities for more than 4-6 players trying to play pax/mail. The factories were mostly taken up as well. For me, I know I'm pretty bad at pak128, but there were only scraps left over to build upon. I've had to connect the cities myself too, since there were no roads to many of them. I'm playing as Canuck service in one corner of the map, and I just can't rake in a profit. It is almost impossible for more than 4-6 players to play pax on a 512x512 or equivalent map, no matter the number of cities. 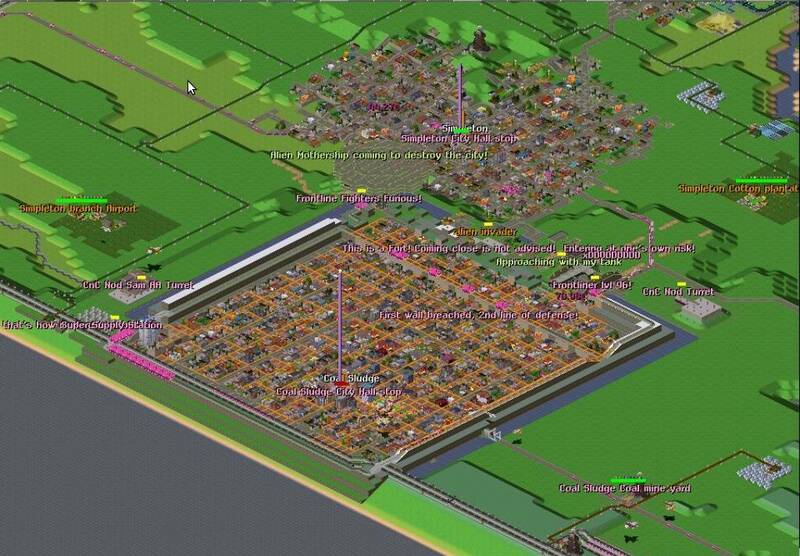 Perhaps I could increase the size of some cities, though, all in all, there are just too many players for the moment. However, come back in a week or two and a more developed map will offer more opportunities. It is always a trade off between lots of opportunity in the short term and playability in the long term, and I usually choose the latter. If Timothy wants to run an A and B server, then perhaps one could be set up for longer term play, and the other for shorter term play: this would help to alleviate the crunch that occurs on long-term maps at the outset. many of the industries have incomplete chains. The industry chains are not broken/incomplete: I have intentionally added extra raw material producers to the map, so that new factories that are created will draw from these industries instead of just building a ring of raw material producers around themselves. This helps to cluster resources as in real life. I did not build this map to be easy, it is supposed to be a challenge But, if there are changes that I ought to make to make netgaming more fun, I want to hear them! One particular problem I saw were the lack of roads connecting the various cities. It's quite costly to setup those roads for a latecomer. i don't know why but right, now the whole pax & mail system died. If it's like you described, I've seen this bug before (but only after it happened while I was offline). All the passenger & mail disappeared off the network (whether they actually disappeared or just no more tried go somewhere I don't know for sure). Players had big losses. I wonder if the developers know about this bug, because it has definitely happened before. Do you happen to have a savegame of this situation? Ie right before and/or after this happens? didn't think of saving it, sry :/. Sound like the step is not running any more; are the train leaving still stations? like i stated earlier after 2-30mins it started working again. unless you set your trains/planes/etc. to wait for full load they were going to their designated areas. If I had to guess, everything works like it should, except the game does not generate any new passenger & mail at origin stations. I don't know if it involved goods too. Jaridan should know. If I had to guess, everything works like it should, except the game does not generate any new passenger & mail at origin stations. I didn't actually get to see it in progress or study it in detail (just know it happened on a past game too). I don't know if it involved goods; Jaridan should know. That means that the step in principle works. // is it time for the next step? when somehow step_inetrvall is very large or delta_t is very small, it would not generate any passengers. But delta_t very small would also not initiate convoi calculating their route and would leave them waiting at red signals for long times, so this must be ruled out. step_intervall is calculated by the city in the lines above. This if it is 1<<21u (i.e. either buildings.count==0 or settings::passenger_factor==0) then it could indeed generate not passengers. Since settings::passenger_factor==0 affects all cities, it looks like the latter. However this should be saved with the game and not repair itself on loading or whatever. Maybe it could be also something in connection with the locality_factor. This is updated every years. Maybe there is a setting with generate something that only gives local traffic for one year. I have no savegame, and it affected all goods, pax and mail. All convoys continued to follow set schedules and wait times. When you looked at the station details, you could see all of the lines serving that station, but the station couldn't "see" that there were any destinations: nothing was listed in the "direct routes from here" list. Opening and closing the line, but not the convoy, schedule dialogs seemed to make the station "see" the route again. Has not happened again today. having loged into your server my client uses about 490288 kB, is that roughly the memory requirement for it? As i understood, cpu doesn't really matter much, is that indeed so? I should guess that capaity is not a major factor either, i wouldn't expect to use too much, do you have numbers there Timothy? BTW, never thanked you enough for what you're doing here, running those servers for more than a year now! This suggests that recalculation routes for goods failed at some point. The action on the line schedule should trigger a new computation, which then succeeds. CPU is very spike-y, but rarely peaks too high. I should set up monitoring for that too really (as well as bandwidth when I figure out a way of tracking it for a specific process). Dont remove that!here it Possible that a Player to plan a big Pojekt. That it not more up to date! Indeed, under certain circumstances routes were not recalculated after loading. This is fixed hopefully with r5925. i Have be look on the photo what vonjo be posted have. Can you remove the green player he have destroy the network game! He have be play master of war. Oh btw this map is great ! Both large landmasses and boats can go almost anywhere ! servers down, or is it just me? It was the listing server which broke, try now. is the server open? possible to join? all slots are taken atm, and there's a slight dc problem due to an added patch , which shouldn't be here yet. Server has been restarted with the latest binary.